When I started the quilt, I didn’t intend for there to be white sashing. I got the blocks finished, laid them out on the floor and it just looked too busy. In the photos you don’t notice how busy the fabric is…but it’s busy. The white really helps tone it down. I went to put the quilt top in the quilting machine and….I didn’t have any batting. Well, that wasn’t quite true. I did have a polyester batting, the kind I used back when I tied quilts. So I decided to use it. I got it set up, quilted the first row, rolled the quilt and oh, no. The quilt top had three stains on it along the edge….I touched it and it was wet. I didn’t want whatever it was to blead onto anymore of the fabirc so I quickly finished quilting the whole thing. I was nervous that whatever it was, wouldn’t come out of the quilt. I bound the quilt and washed it and thankfully the stain came out. I think I had set the batting on the kitchen table it must not have been clean. 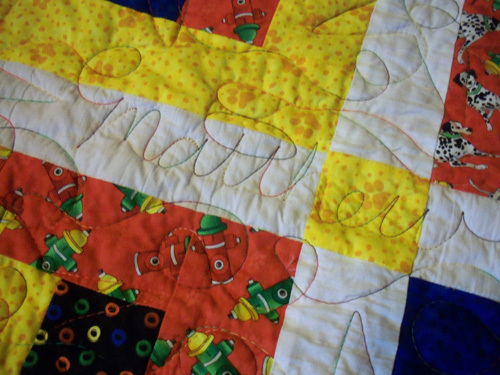 Here’s Matthew’s name written in the quilting. If you are interested in making a quilt like this, here’s a few short instructions. 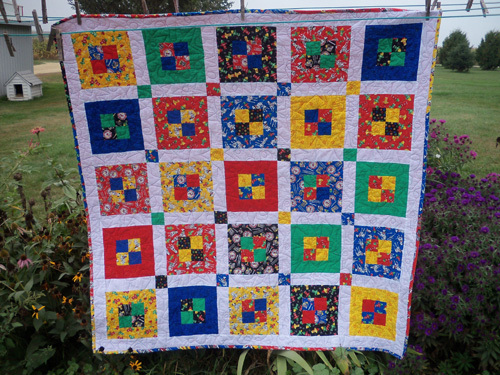 To make a block, you need 4- 2 1/2″ squares for the center of the block. The frame around the center is made with 2- 4 1/2″ x 2 1/2″ rectangles and 2-8 1/2″ x 2 1/2″ rectangles. Make 20 of those blocks. For the sashing cut 8 1/2″ x 2 1/2″ pieces and 2 1/2″ squares. Using the polyester batting makes the quilt feel like what I call a “cold blankie”. It’s a term I made up when I was little….a “cold blankie” feels cool in the summer and warm in the winter. There’s just something light and airy about them. …now I have two girl baby quilts on my radar to finish. My nieces and nephews just keep having babies so I guess I’ll just have to keep making baby quilts.